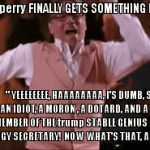 prick perry gets it right! He's a Moron In trump StableGeniusClub & Energy Secretary! He's"thinking" What's That & What Do I Do?